Iron County is a place that brings natural beauty and recreation together with the business community. With over 2,000 lakes and 900 miles of rivers, a person is never very far away from a swim, a fish, or boat dock. The business community is also important to the area. Over 300 businesses and professionals are members of the Iron County Chamber of Commerce, and work together to improve the economic future of the county. While Iron County was established in 1885 as a site for the promising development of iron ore for the steel factories, the production of the ore ended in the late 1970s, and the logging and forestry industries have replaced mining as a primary economic factor in the area. Iron County has also become a recreational and tourism haven in the western part of the Upper Peninsula. This guide is an excellent resource to information about Iron County. We encourage readers to patronize the businesses that advertise in the guide, particularly those businesses that display their membership in the Chamber of Commerce. 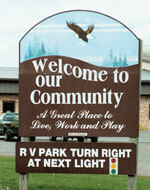 Please visit us and let us show you that Iron County is a great place to live, work, and play. For more information, call the Chamber.